Ok, So a little while back I posted a question about air filters and building one. Since then thanks to some Christmas money and a clearance at HD I actually purchased a Rigid Air Filter. I finally got it mounted this past week after few modification to the mounting concept. It seems the prefab floor joist they used to build this house are not what people think of when they tell you to mount it using the floor joists. So I added a little insulation to the ceiling and strapped the unit up. It is now good and tight against the ceiling and the ceiling tiles I glued together and then glued to the floorboard does a good job quieting it down upstairs. I will try to keep in mind to post an tool review of this unit in the future once I have used it a couple of times. This coupled with a ShopVac that my sister gave me for Christmas should help me control a good amount of the dust in my shop. Still have to get some pieces to use the shop vac with tools (waiting for the upcoming wood show to see what they have first). Still using my mini shop vac and a broom with dustpan to clean up on a pretty regular basis. 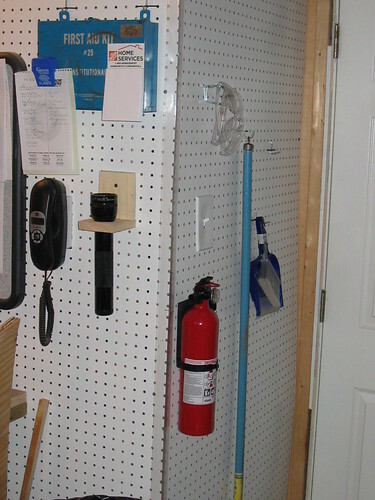 I also recently added a much needed piece of safety equipment, a fire extinguisher is now installed right by the door to my shop not far from the first aid kit (which despite its look is up to date). Well thats all for now, I have the day off tomorrow so I plan to further work on my shop and one other project that I need to get done, hopefully post more on that later. Safety should always be a woodworkers top concern. Hard to do anything without fingers. Too often we, as woodworkers, tend to focus more on “git it done”. We tend to overlook seemingly nuisance safety devices such as splitters, blade guards and air cleaners. I applaud your emphasis on safety both from a fire and a personal exposure standpoint. I agree with Gary’s statement but would also like to add it is hard to continue to practice woodworking without the ability to breathe correctly. Hey LJ brother, you should check out the blog I did on dust collection. It might give you some ideas for when you go shopping. Hey all thanks for the comments. I attended Vocational school and safety was a key concern at all times, just trying t figure out new ways of safe now that I am doing the woodworking, machines are not a problem for me as I was taught to teach tem with respect no matter how many times you may have used them. It is the more subtle things like that dust I need to keep in mind. Todd, great information in that blog. I will most certainly keep it in mind as I continue to work on configuring the shop space. Hey Chris, Yeah that ever collecting sawdust. I have a jet air cleaner and the good old shop vac too. 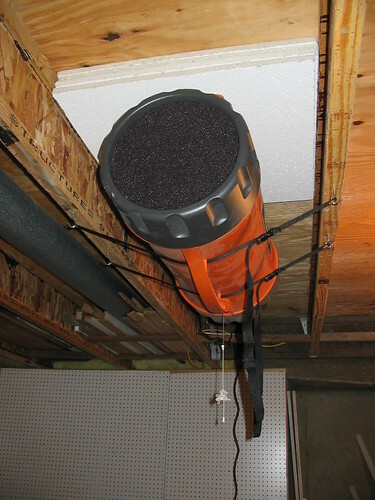 The air cleaner is a great addition though it helps get that really small nasty stuff that seems to hang in the air forever out of there and help you breath easier. Won’t do the job the big guys do with their big expensive systems, but we littlle guys do what we can…LOL Every little bit helps keep chippin’ away at it I’m in there with ya. 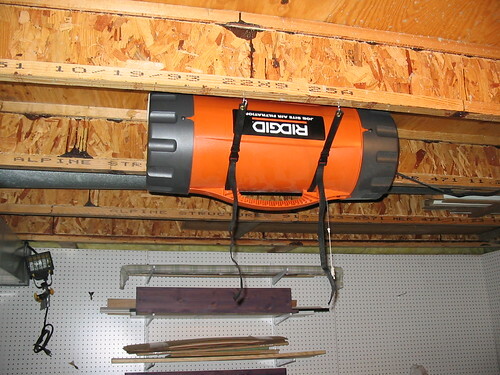 I was considering something similar for my small garage shop – I didn’t know Ridgid made an air filter. I’d love to see a review of it if you’ve got the time!